This photo was taken as it was getting towards morning. 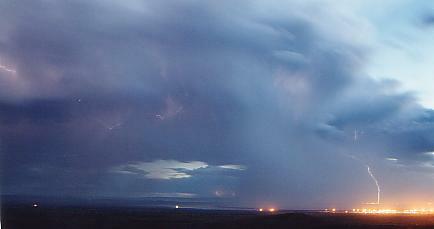 As you can see from the movement of the cloud the shutter was open for a long time and not much lightning occurred. This photo was taken even more towards morning. You can see about one third of the way up from the bottom and dead in the center of the photo there is a distant storm. That storm is over the other side of Spencer Gulf and behind the Flinders Ranges. It is probably more than 40km away. 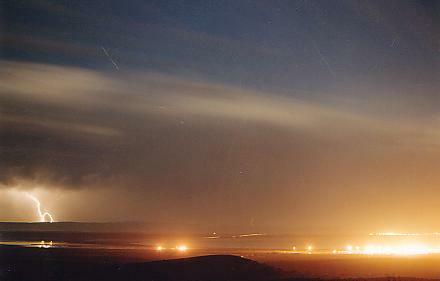 There are more photos which show the lightning up over the Flinders (though from a different storm). It is surprising to see lightning that far away, usually there is a rain sheet from the closer storms which stops those further away from being seen. I remember there was very little rain this night, which is good for lightning photography (especially for electronic cameras). There are more photos from this storm on the next page.